After the visual feast that was “An Actor’s Revenge” (1963) and the brooding nihilism of “Enjo” (1958), it was a bit jarring to step into the world of Kon Ichikawa’s 1960 picture “Her Brother.” Lacking the stylistic flourishes that made the director popular with a very specific type of cinephile, “Her Brother” – though far more sedate in form – is a deeply emotional exploration into the bonds that make up the family unit. Yet another adaptation, this time Aya Koda’s autobiographical “Ototo” first serialized in a newspaper during the late 1950’s, “Her Brother” focuses mainly on the sibling relationship between Gen (Keiko Kishi) and Hekiro (Hiroshi Kawaguchi), the titular brother in the title. As the film scholar Alexander Jacoby stated when introducing “Her Brother” at the British Film Institute several years ago, Ichikawa’s oeuvre can be divided into two separate groups: the ironic and the sentimental. It is obvious from the moment this film opens with its schmaltzy orchestral soundtrack that “Her Brother” leans far more towards the latter than the former. Gen and Hekiro’s close relationship is in many ways familiar to anyone who has a sister or brother, but because of the circumstances is also quite unique. With a cold absentee father, played by Masayuki Mori, and an ultra religious Catholic mother (Kinuyo Tanaka) who seems to shun any kind of housework or parenting – instead preaching and lecturing to her stepchildren about being “good” – the two teenagers must take care of one another. Gen and Hekiro ultimately have a bond that vacillates between a mother-son type of relationship and something reminiscent of a married couple. Gen seamlessly transitions from teasing her little brother about his stupid antics to preparing his dinner and then afterwards mending his torn clothes while he sleeps beside her. Add to this fact that Kishi and Kawaguchi look far older than their adolescent characters, and you have quite an interesting dynamic between the two. Collaborating yet again with Kazuo Miyagawa, Ichikawa and his director of photography actually invented a process called ”bleach bypass” wherein the color film, when projected, would appear to have a de-saturated color palette resulting in the picture having a grainy faded appearance. The effect, often used in period films to automatically lend the cinematography a vintage look, is utilized in “Her Brother” for basically the same reason, and also adds to the feeling that the film is a stand-in photo album charting Gen and Hekiro’s history. Aside from that, the film visually is nothing remarkable. The moments when Miyagawa is allowed to move his camera or lift it off the tripod are few and far between. Narratively speaking, the movie is primarily episodic in structure but by the film’s last third begins to coalesce into a tragic family melodrama when Hekiro suddenly contracts tuberculosis. The plot development of Hekiro’s sickness though cliché does serve a purpose. For almost an hour of the film’s runtime Ichikawa lampooned the very idea of the happy healthy Japanese family, but with the introduction of Hekiro’s illness grants every character one final moment to redeem themselves. Gen accepts her role as the family caretaker, the father finally allows himself to openly feel something, and the mother realizes just how flawed and arrogant she was. Though ending on a death, “Her Brother” is one of Ichikawa’s more positive pictures, especially compared to “Enjo” and “An Actor’s Revenge,” due in large part to the director not shying away from engaging with these characters. The sad, funny and happy moments that Ichikawa puts on-screen are far more moving because the director invests so much time in making us care. Transforming a picture that could have been a trite pandering piece of schmaltz into a classic family melodrama filled with a genuine bittersweet sentiment. 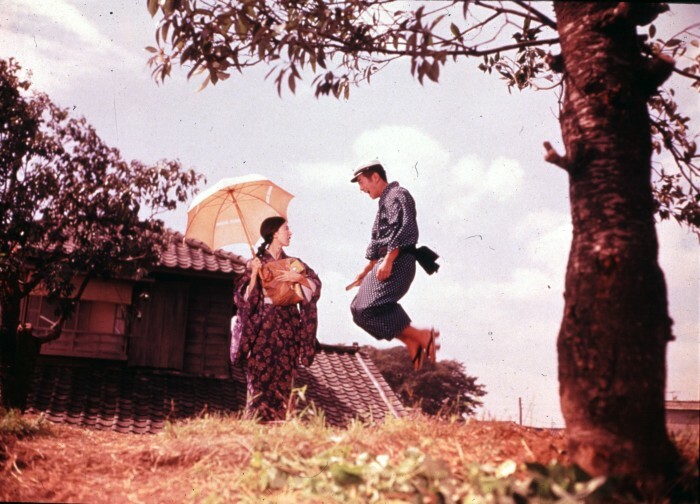 The restored version of “Her Brother” screens in 35mm at the Japan Society in New York on Sat., Oct. 17, at 4 p.m. as part of a three-film series on Kon Ichikawa. For ticket information, go to japansociety.org.